Every Adventure Rider needs a place to carry their gear while on the road. The right luggage will provide a safe location for your travel equipment, and ensure you know where to find it when the need arises. But more than that, the right luggage can offer the rider additional protection from the elements, and provide a sort of sacrificial armor in the event of a tip-over. From soft bags to hard luggage, finding the style that’s right for you requires thoughtful comparison. 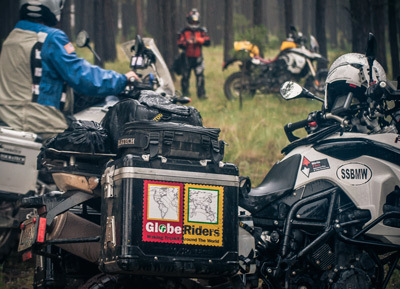 Both hard and soft luggage offer great benefits to the adventure rider above and beyond storing your essential gear. Hard metal luggage offers a solid durability that can keep your items safe in the event of most tip overs. You can also depend on better security of your items as hard luggage offers tamper-resistant locks and steadfast fastening to the motorcycle. all in all your price point is higher but your durability is greatly increased. Jesse Luggage, Happy-trail Luggage, and Touratech’s Zega cases are major contenders for your consideration of hard cases. Most makers of Hard luggage also provide a soft luggage alternative. For those looking for greater “dexterity” off-road; soft luggage offers rugged protection while not adding significantly your overall carry weight. Often, soft luggage is constructed of heavyweight treated canvas so falls and slides are no problem and in most cases, the luggage will still maintain it’s water resistance. Because the luggage by nature is pliant, space inside should be reserved for durable items with breakables placed in a top case or tank bag. Price point is a major attraction for soft luggage. Given today’s technology, soft luggage offers rivaled durability at a very attractive price. 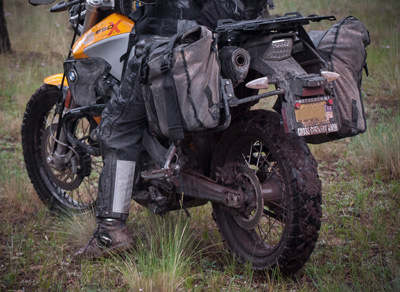 Giant Loop, Wolfman Motorcycle Luggage, and AltRider offer great solutions for soft luggage. Side cases just not providing enough storage for all your adventure riding gear? Side cases packed to the gills, pockets full, and you still need room for that chapstick? Might we suggest a tank bag, top case, or a top bag that straps to the top of your packed cases or engine guards? Now you have room for your kitchen sink when it comes time to wash up at the end of the day. Many of the companies mentioned previously and featured below offer additional storage. Be careful though, remember you still need to stand up and shift your body weight freely to properly navigate the backcountry. 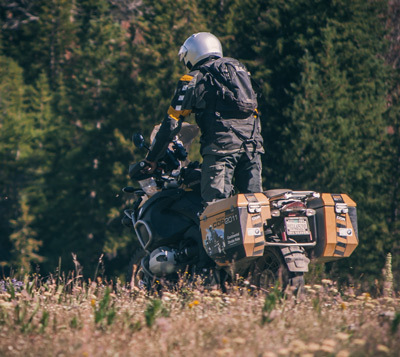 Some great items to consider are Wolfman’s Explorer tank bag, Happy-trails’ Nerf Horn bags, Giant loops’ Tank and Handlebar bags, and AltRider's Hemesphere bags.